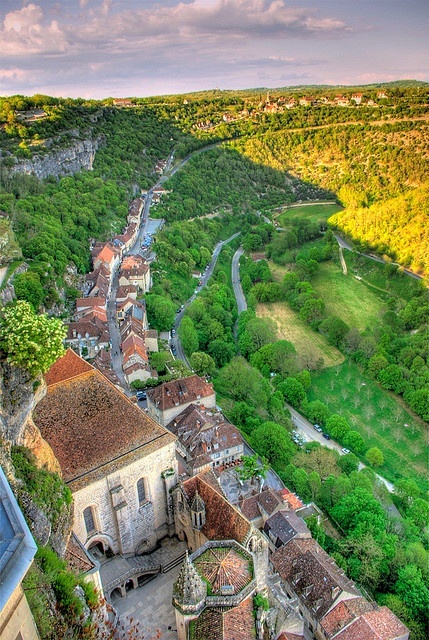 Rocamadour is a commune in the Lot department in south-western France. It lies in the former province of Quercy. Rocamadour has attracted visitors for its setting in a gorge above a tributary of the River Dordogne, and especially for its historical monuments and its sanctuary of the Blessed Virgin Mary, which for centuries has attracted pilgrims from every country, among them kings, bishops, and nobles. The town below the complex of monastic buildings and pilgrimage churches, traditionally dependent on the pilgrimage site and now on the tourist trade, lies near the river on the lowest slopes; it gives its name to Rocamadour, a small goat's milk cheese that was awarded AOC status in 1996.